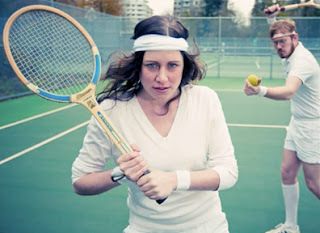 If you have not heard of Tennis (the band) or the song "Marathon" you are in for a treat. The duo that consists of husband and wife, created one of the catchiest pop tunes I think I have heard in a long time. This is one of those songs with the wife's wonderful vocals over the organ and guitars, that you cannot help but enjoy. It has an old school feel, while doing something other bands are not. Tennis created a song that will have you either snapping your fingers, saying the "oohs" with the band, singing, or all three. I have a feeling 2011 will be a bigger year for this couple. Listen to "Marathon" below.